Happy official start of Summer! Anyone else love a good healthy dip that doubles as the perfect appetizer? I love entertaining, and serving fresh and light meals that highlight the flavors of the season, but I don’t always have time to prepare a fancy meal. This Italian three layer dip looks so pretty and sophisticated, and it comes together in a snap! A bright basil and parsley pesto meets sun dried tomatoes and creamy goat cheese to make this dreamy dip. I serve it with a nutty crispy cracker alongside a nice hummus or crudités platter, but toss it with hot pasta for a quick meal, or use it as a spread on a wrap or sandwich. Add basil, parsley, salt, pepper, garlic, and olive oil to a small food processor, and pulse until smooth. Add more olive oil if needed. Sign up to receive recipes directly to your inbox. You'll also get a download link to my free pantry and shopping guide. The Best Stovetop Popcorn, and Four Perfect Flavors! My name is Amanda, and I am so happy you stopped by! 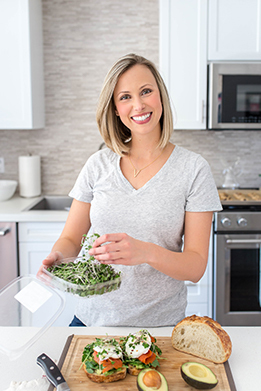 I'm a champion of healthy meals, all things sourdough, a good cup of coffee, and of course, sharing my favorite recipes and food adventures with you! Feel free to leave a comment, send me an email, or track me down on social media. I love hearing from you, and seeing all of the delicious creations you're making. Enjoy! Copyright 2019 - A Thousand Crumbs. All Rights Reserved.